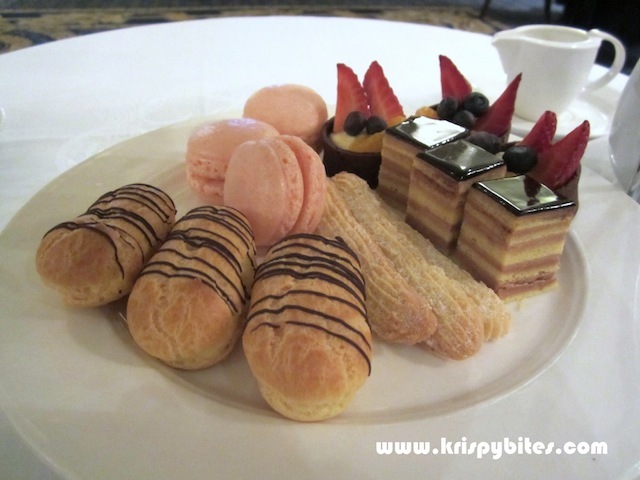 The Fairmont Palliser in Calgary boasts a grand and luxurious afternoon tea setting, right in the spacious lobby with high ceilings and flanked by tall marble columns. Since this area of the lobby is off to one side and away from reception and the elevators, it still feels quite private and is effectively closed off from the main entrance area. 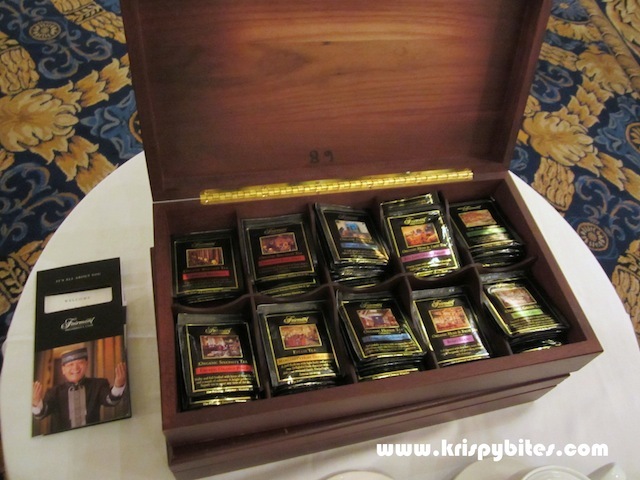 Tea was served in the form of teabags by default, although the menu stated that loose leaf tea is also available upon request. 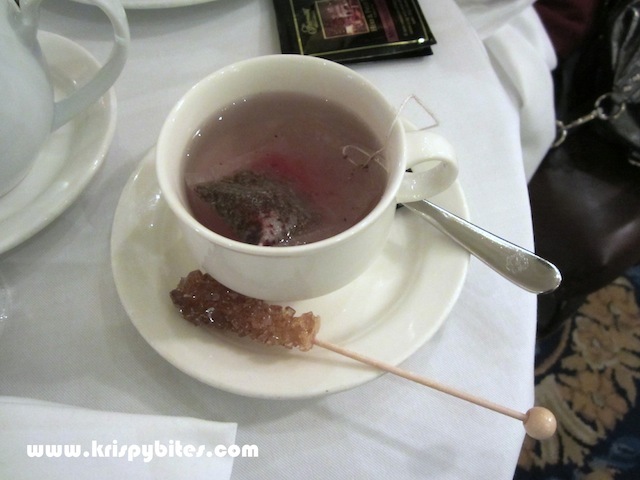 The sugar swizzle stick for sweetening the tea was a fancy touch. The palate cleanser was a fresh fruit cocktail, served with Grand Marnier syrup. 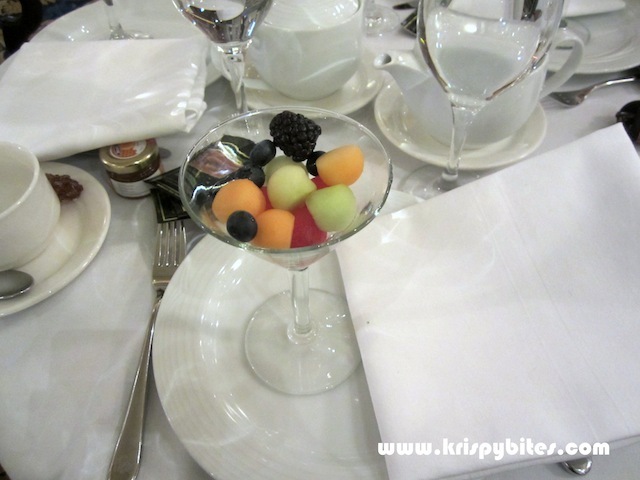 I couldn't taste any Grand Marnier, but you can't go wrong with fresh fruit. 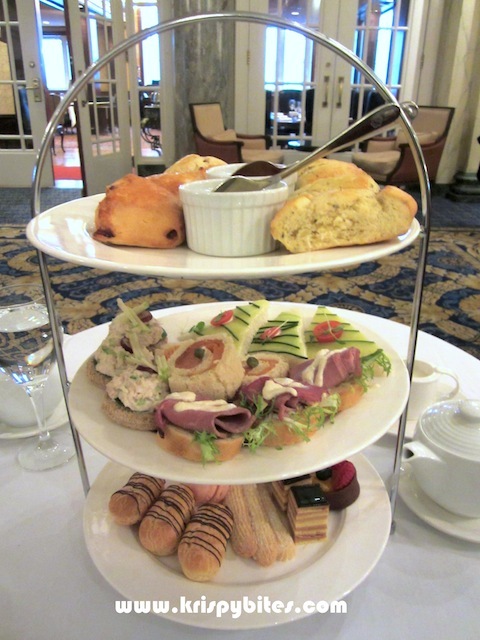 The food tower was pre-made and arrived at our table almost immediately after tea was served. 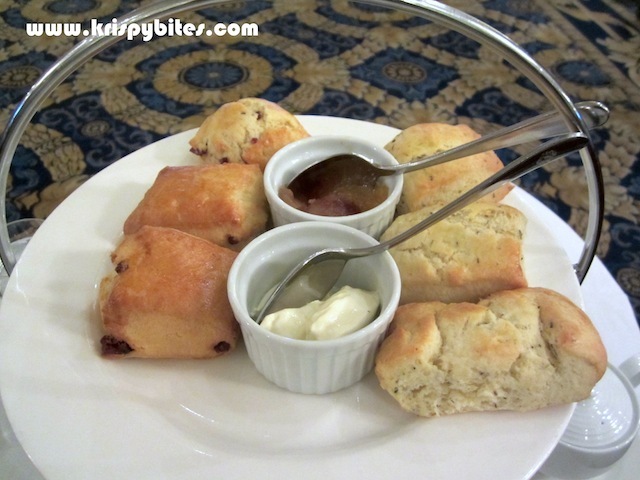 This meant that the scones were served cold and not "oven fresh" as advertised. The texture was gummy, doughy, and not fluffy at all. We had two flavours: dried cranberry and lemon thyme. The lemon thyme was the preferred choice because it at least had some sort of lemon taste to it. The cranberry scone was just a bland and stale piece of dough. 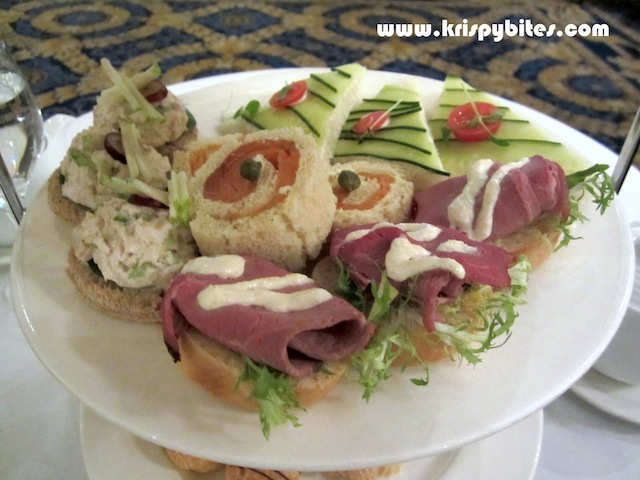 All of the bread in the savoury tier was served cold and dry, as was the sliced roast beef. The only thing good on this plate was the shortbread cookie. The dobos tarte was alright too, but everything else was just unsatisfactory. The eclair even had a stale freezer taste! 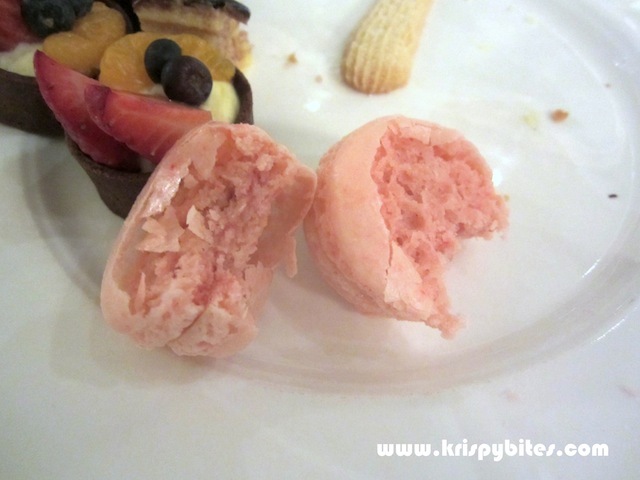 In particular, the French macaron was unpalatable. The shell crumbled upon touch, and I found that the meringue cookie did not rise properly. It was a sticky mess with a thin shell that separated from the rest of the cookie, and there was almost no filling or flavour. 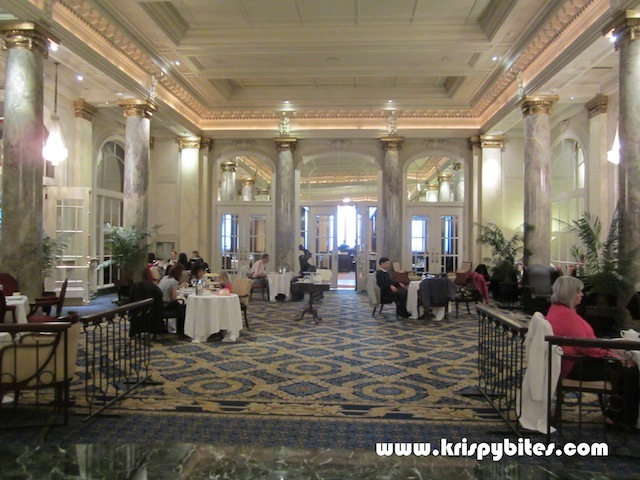 This afternoon tea experience was $30/person, and I can honestly say it was not worth the money apart from being able to dine in such a grand lobby. I don't regret it as a one-time experience, but I will not be back again.